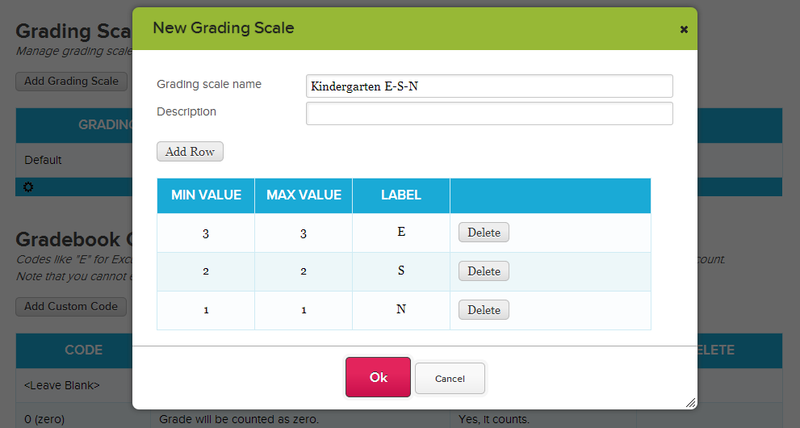 With QuickSchools, you can set up /use a Kindergarten grading scale for your Gradebook. If you have access to Grading Setup (administrators can use the Features Page to configure access), just click on the “Add Grading Scale” button. This method is for an administrator to create a shared grading scale for all teachers in the school. Individual teacher can create their own grading scales as well, but these would not be shared. You’ll see from this example, that you can use the Gradebook not only to assess specific skills or evaluations, but you can also add public and private comments. Public comments are available to parents via the Parent Portal. Just make sure that after selecting the appropriate grading scale, when you add a new column, the total marks for the column should match the highest grade in the grading scale (so in this case, the highest grade of “E” is 3 points). For more info on our Gradebook, check out the New Gradebook Features on HTML5. If you want to set up standards-based Kindergarten report cards, check out the article on Report Cards for Primary (K-3/K-8) Schools. We also have Online Manuals available on docs.quickschools.com. If you need any help setting up the Gradebook or Report Cards for Kindergarten, please come chat with us. We’d love to hear from you. Please feel free to share your comments and feedback as well.